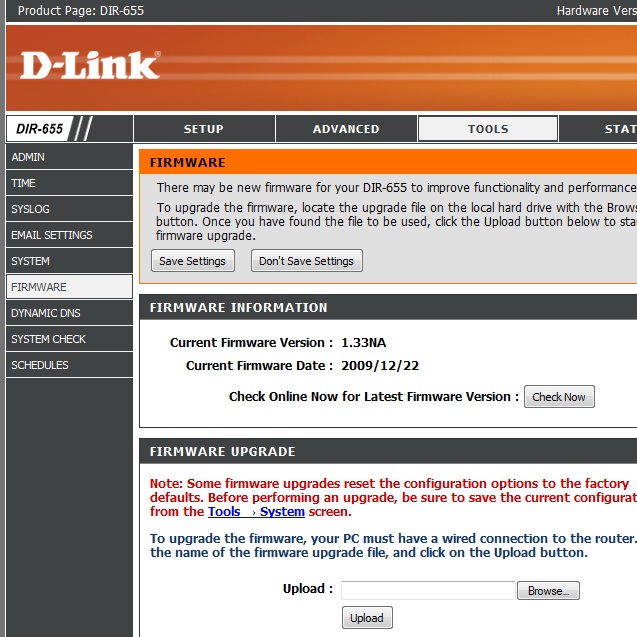 After installing Firmware 1.33NA, did you experiencing that your D-Link DIR-655 router is behaving properly/normally now? Ben? Popolito? toto? Is the router working properly for you know toto? Or you still feel axing your router? Thanks!!! After installing Firmware 1.33NA, are your D-Link DIR-655 routers now behaving properly/normally? Ben? Popolito? toto? Is your router working properly now toto? Or you still feel axing your router? Thanks!!! In my case 1.33NA worked much better than any of the other 1.3x firmware. The same in my case, the router is working ok again. No problems so far and i’ve upgraded the day after the new firmware appeared on ftp site. Why do you ask? I have a friend who recently bought D-Link DIR-655 router which has 1.32NA f/w on it, and he too sometimes experience dropping connections on this router (or freezing while browsing – I guess the DNS issue). So I was wondering if this 1.33NA will indeed fix this dropping issue, and it seems like it will. Thanks again! Just an FYI, d-Link has released firmware 1.33NA for the DIR-655 on their site. We just upgraded two DIR-655 routers to 1.33NA firmware. After 3 days, one router experienced losing connections about once or twice a day (compared before w/ 1.32NA – a lot of times everyday). The other router on the other hand, we didn’t experience any problem, yet. My only question is, on both of these routers, after upgrading to 1.33NA, we noticed that the “Enable DNS Relay” is “unchecked” (Setup – Network Settings – Router Settings). So I don’t why it is unchecked. The “Enable DNS Relay” is supposed to be checked, right??? Anybody? Thanks!!! DNS relay simply means that the router is used as a DNS cache by default, if you had it on before then you should probably put it back on, in the past this feature has caused problems but the majority of users believe it is fixed now. K! Thanks Ben! I still wonder why it is showing unchecked after upgrading the F/W to 1.33NA. Unchecked should be the default. A lot of issues occur with having DNS relay enabled on D-Link routers. Especially SIP VoIP calls suffer when DNS relay is enabled. Just curious John, why would SIP VoIP calls suffer if DNS relay is enabled? How and in what way? What I know is that SIP VoIP calls will suffer if the Stateful Packet Inspection (SPI) and SIP-ALG are enabled on Firewall settings, but not if the DNS Relay is enabled.